Telenor is an innovative communication services providing company that is always trying to give something best to the customers. The firm knows the needs of the customers concerning how to engage the users on one SIM for a long time by providing some economical and appealing package. 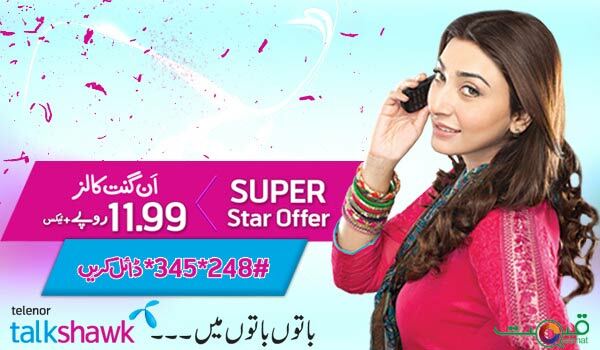 Telenor launches the “Super Star Offer” that allows you to make an unlimited number of calls to other Telenor numbers. Now, there will be no need to pay the charges for every single call. You can make unlimited calls on Telenor to Telenor numbers (on net calls), but not allowed to make calls on the off net numbers. You cannot avail this offer between 7pm to 10pm as per terms and conditions imposed by the company. Offer is just valid from 12am to 12am, i.e. for 24 hours, after that it’s up to you if you want to carry on with it or not. If you have enjoyed the package, you can activate it again for the next day. Offer charges are Rs. 11.99 +tax that will be deducted from your account balance. In case of low balance, you will not be entertained with this offer. If you want to avail this offer continuously for the whole week, the charges will be deducted on daily basis. You just need to dial *345*248# to activate this unlimited call offer to stay tuned with your friends and family all the day long. You are unable to use this package during the hours between 7pm to 10pm. It is not the good news for the customers, because during this time, they will have to pay the routine charges on each call.